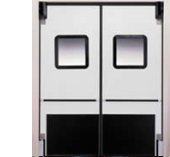 This lightweight patented door is rotationally molded from cross-linked polyethylene and is known in the industry for its ruggedness, ease of maintenance and long service life. The rotationally molded door forms a one-piece, 1/8″ outer skin that has no gaps or joint seams, is impervious to moisture, acids, petroleum products or animal fats. Non-CFC urethane core is foamed-in-place to insure a tenacious bond between the core and outer skin, providing an excellent thermal separation and sound abatement. 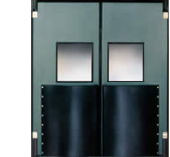 This lightweight patented door is rotationally molded from cross-linked polyethylene and is known in the industry for its ruggedness, ease of maintenance and long service life. The rotationally molded door forms a one-piece, 1/4″ outer skin that has no gaps or joint seams, is impervious to moisture, acids, petroleum products or animal fats. The foamed-in-place Non-CFC urethane core (permanently bonded to the outer surface) does not break down when impacted and provides excellent insulation and noise control. 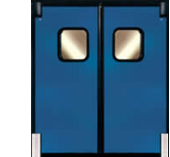 This lightweight patented door is rotationally molded from cross-linked polyethylene and is known in the industry for its ruggedness, ease of maintenance and long service life. USDA accepted gasketing is durable and easily replaced in the field. The rotationally molded door forms a one-piece, 1/4″ outer skin that has no gaps or joint seams, is impervious to moisture, acids, petroleum products or animal fats. Overall panel thickness is 1-7/8″ and retains its properties to 40oF. Can be sized up to a 8′ x 8′. Recommended when the temperature differential exceeds 30°F. 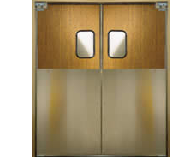 Fully insulated doors are constructed with 1-1/2″ wood/foam core and is clad with full height high pressure laminates, ABS impact resistant plastic, FRP, stainless steel, galvanized steel or aluminum surface coverings. Shatterproof polycarbonate double pane vision panels available in a variety of sizes. Patented ProLoc™ edge system chemically bonds to the face sheets providing a positive seal and preventing moisture or contaminates from entering the door panel. Engineered for supermarkets, restaurants, prep rooms, department stores and light industrial areas. Recommended when the temperature differential is less than 30°F. Shatterproof polycarbonate single pane vision panels provides clear visibility. 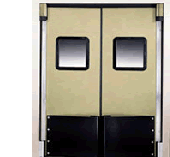 Proline Doors are designed for forklifts, motorized pallets, pedestrians and cart traffic. Panels are constructed with 3/4″ wood core and is clad full height high pressure laminates, impact resistant ABS plastic, FRP, stainless steel, galvanized steel or aluminum surface coverings. 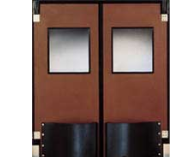 Double-Acting impact traffic doors are constructed with a solid cabinet grade wood core. Chase SC 3000 Series offers a wood core with an exterior cladding of .032 thick anodized aluminum or high pressure laminate in any color or style of your choice. Door panels are equipped, on both sides, with 48″ high 18 gauge stainless steel impact plates and stainless steel edge capping, for protection and a finished look. Optional perimeter gasketing provides a positive seal for thermal and visual separation.